115 Germany, Iron Cross 1914, Cross of Honour 1914-18, ribbon bar with crossed swords. GVF. (3). 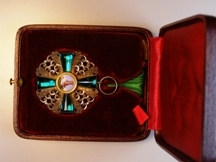 966 Germany (9), Franco-Prussian War Medal, 1870-71, Bavarian War Merit Cross with swords, bronze, in case. Iron Cross, 1914, 2nd class & Cross of Honour 1914-15, Prussian "Blue Max" copy, Hanseatic Cross 1914. 1914-18 Veterans Medal. 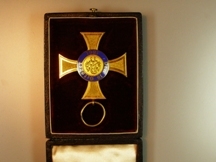 1914-18 Honour Cross and War Merit Cross. GVF or better. (9). 1914 Germany, Prussian, First to Second World War badges in metal & cloth, many Air Force. Sold as seen, no return. (10). 1878 Huth, J. Frederick, 50th Wedding Anniversary medal 1856, by Wyon, 45mm., AEF. Frederick Huth (1774–1864), a merchant and merchant banker born in Germany. 911 Germany, Party Day, Religious, Relief and labour badges (8), metal, card and plastic. Together with Charity Town Badges (4) from 1930's and 1940's. With pin fittings. GVF. (12). 1002 Germany (8), 1914-18 Cross of Honour with swords, Iron Cross 1914, 2nd class, War Merit Cross 2nd class, with swords (2), War Merit Cross 2nd class, without swords, Winter Campaign Medal 1941-42, Police Faithful Service Decoration. West Wall Medal. Viewing recommended - no return. 1000 1939-45 Star, France & Germany Star, Defence & War Medals, Germany, Iron Cross 2nd Class 1939, Poland 1939-45 Anniversary medal with certificate. GVF (5). 770 Germany, W.W.2 Infantry Assault badge, silvered metal, Wound badge, bronze, War Merit Cross with swords 1939, Winter Campaign Medal 1941/42, Italy, African Campaign Medal. GVF. (5). 1390 Germany, First World War Iron Cross, 2nd Class without ribbons (7). GVF. 1382 Germany Wilhelm II Consecration of Kyffhauser Memorial 1896, by M & W Stuttgart, bronze, 58mm. AEF. 1589 Germany, Kings of Bayern silver medals (6) each stamped "ZA999,9". In sealed plastic folder, total weight 96g. FDC. In case of issue. 415 Germany, Wilhelm II,"Consecration of the kyffhauser Memorial 18 Lune 1898" by "M & W. Stutt." 60mm, EF & scarce. 685 Germany, Baden, Order of the Zahringen Lion, Knights 2nd class breast badge in silver & enamel with gold centre. In case of issue. EF. 1714 Germany Iron Cross 1914 & 1939 - both 2nd class, Winter Campaign Medal 1941/42. EF. 1706 1914-18 Victory Medal (123028 Pte. E. Puckett, Hamps R.).1939-45, France & Germany, Africa (2) and Burma Stars, Defence & War Medals. E.F. (8).